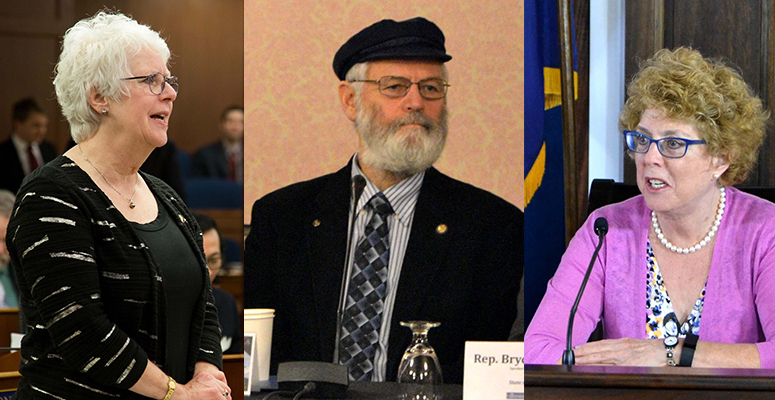 The Division of Elections has blocked the Alaska Republican Party’s attempts to block primary access for three Republican representatives who formed a majority coalition in the House with Democrats and independents, KTVA reported this weekend. The Alaska Republican Party hoped a recent ruling that could allow the Alaska Democratic Party to open its primaries to independents (something that’s still working its way through the courts) would allow it to bar specific candidates from its primaries. The Alaska Republican Party’s central committee voted to boot Reps. Louise Stutes (Kodiak), Paul Seaton (Homer) and Gabrielle LeDoux (Anchorage) from the 2018 primaries for their role in forming the mostly Democratic majority coalition. Division of Elections Director Josie Bahnke disagreed, rejecting the rule change on multiple different points in a letter dated Dec. 7. “The Division will not take any action at this time for several reasons,” she wrote. The Democratic Party’s lawsuit targets a completely different part of state law. It does not stop the clock on the deadline for the above law. Alaska law currently allows any registered Republican to run in the Republican primary, a matter has already been litigated and upheld in Alaskan Independence Party v. Alaska. None of the candidates targeted by the party’s rule have filed with the Division of Election to run in the 2018 Republican primary. It’s not the first time that conservative efforts to boot coalition representatives from office in favor of party-line Republicans has fallen short. Earlier this year, we reported that a recall petition targeting independent Rep. Jason Grenn was rejected because it was filed with the wrong election office. The group, which has affiliations with former Rep. Liz Vazquez, filed the recall with the Municipality of Anchorage, not the Division of Elections. It was an ironic end for the effort, which sought to boot Grenn from office based on incompetence. Alaska Republican Party Chair Tuckerman Babcock told the Anchorage Daily News that the party will likely wait on the outcome of the Democrats’ lawsuit before proceeding. The party has not yet authorized its own lawsuit. A Republican lawsuit challenging the Division of Elections’ ruling is likely a lost cause because the issue of banning certain people from primaries has already reached the Ninth Circuit (Damn that Ninth Circuit!) in Alaskan Independence Party v. Alaska, and the court ruled party officials cannot cherry-pick its slate of primary candidates. The court went on to explain that the party’s associational rights aren’t being infringed because nothing stops the parties from, in effect, talking smack about candidates that party officials don’t like. Summed up: Unless the Alaska Republican Party is willing to commit to a lawsuit to reverse this ruling or, perhaps, change state law altogether, then Stutes, Seaton and LeDoux will likely be able to run in the Republican primary (and the Alaska Republican Party will be able to scream up and down about them being secret Democrats). Be the first to comment on "State rejects Republican attempt to boot bipartisan coalition reps from primaries"